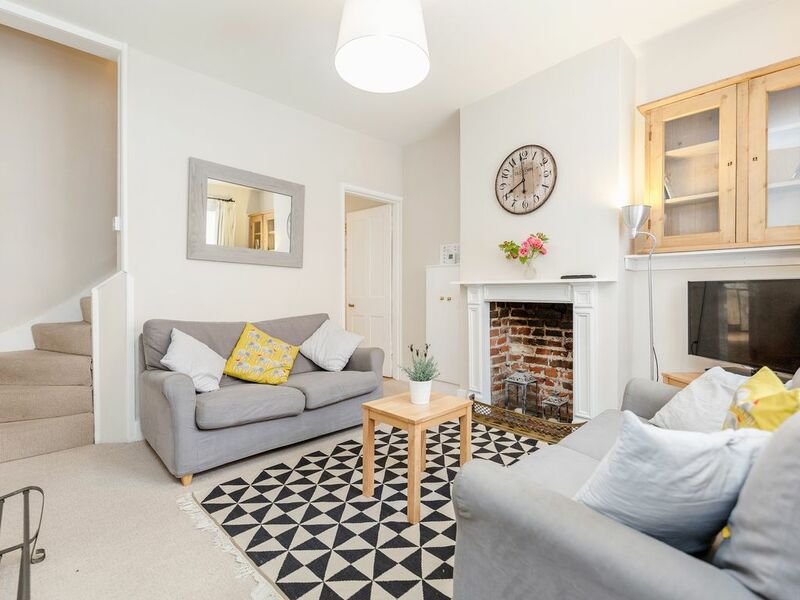 Charming period cottage quietly situated in one on Winchester's quaint old streets. This renovated cottage still retains the old features which give it plenty of character - old fireplaces and doors and twisty old staircase. It is ideally situated in the city centre, so all the historic sites, the world class restaurants, bars, live theatre and markets are a very short stroll, there are also many delightful walking and cycling trails along the river and up onto the famous South Downs. This cottage makes a very homely and comfortable base to come back to after a day out exploring or at work, and the beautifully fitted out kitchen/dining room invites you to enjoy a meal, cooked by yourself or a take-away - we can also arrange a cook to make a romantic dinner for you should you wish. During the summer months you can enjoy the garden with its terrace for al-fresco dining or relaxing, this is accessed by a flight of quite steep steps. We have been running our holiday letting and b&b business in Winchester for over 20 years and now own and manage properties from small one bedroom apartments to several 2 bedroomed houses all of which have their own very different characteristics. We also live in Winchester, a city which has so much to offer. Comfortable, cosy cottage to pop in and out of while exploring and enjoying the historic sites and world class shops and restaurants in this exciting city. Relax and dine al fresco in the sunny garden in the summer, or enjoy cooking and eating in the stylish kitchen and chilling out in the sitting room with its original fireplace lit up by candles. Brilliant location. Cosy cottage with everything we needed. Really enjoyed staying in the cottage. It’s location meant that everything was easy walking distance. The cottage is well equipped and thoughtful touches like fresh milk in the fridge etc were much appreciated. Caroline also kindly accommodated us when we brought our arrival date forward. 5-day pleasant stay in St John. We had a 5-day pleasant stay in this cottage second week of December. All equipment worked and we easily could set the temperature to our conveniance. Sitting and sleeping were all very relaxing. The location so near the centre, but in a quiet lane is very nice. The only negative remark to be made is that there are two nails sticking out in the carpet of the staircase. Walking bare foot was an unpleasant surprise. I am sure that this inconveniance will be removed quickly. Thank you for your review, I am glad you had a good stay. I am so sorry about the loose nails - we will take a hammer around so they are not a problem for anyone else! The cottage is cozy and comfortable. We slept well between convenient walks along Itchen waterways and easy walks into town. Great location, sweet peaceful lodging, glad we stayed here. Pilgrim's Way cottage is on a quiet street in the middle of Winchester, a couple of minutes' walk to shops, restaurants and the attractions of the city centre. The cottage itself was spotlessly clean and cozy, with a very well appointed kitchen. The owner was readily available to answer any questions and the deposit was promptly returned after checkout. Thank you for your great review. Glad you enjoyed your stay and we hope we can welcome you back in the future. Cosy atmosphere and great location! Beautiful Cottage in centre of Winchester! Wonderful property in the centre of Winchester. Perfectly situated for exploring the town. My family and I loved our stay and were delighted with the cottage itself and it’s location. Winchester is a major historical city being the ancient capital of England. The cottage is located in a historical road, the Pilgrims Way, Winchester is an ideal base for exploring Central Southern England. Many walks and trails including the South Downs Way from the cottage. Security deposit to be paid at the time of paying the full rental please. This will be returned to you all being well after you leave Listed rates subject to change depending on season and number of guests staying. Once the booking deposit is paid this is non refundable.